“A soup is only as good as it’s broth”. Truer words have never been spoken. I’m a serious broth/stock nut and have been known to drink it straight up out of a mug over tea or coffee on a cold day. I love that I can pack it full of high antioxidant spices and inflammation reducing herbs then mix and match whatever ingredients I have on hand to make an easy meal. 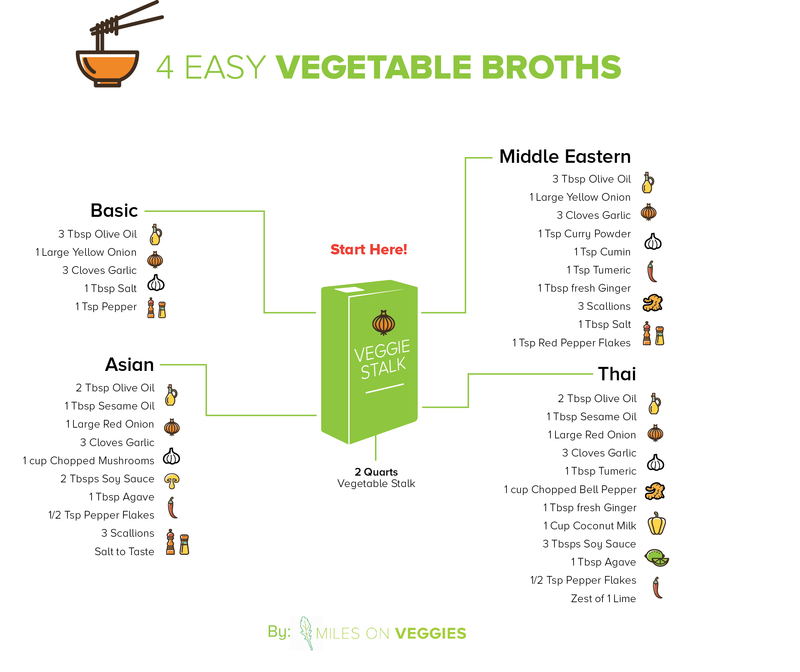 Broth is a staple every home chef should have up their sleeve to build easy meals and big flavors in a pinch. This winter I’ve played around a lot more with flavor combinations and cooking techniques and have narrowed down my top 4 variations to share you along with easy pairing suggestions. We’ll kick off with the most basic version. A common error I see new chefs making when building their broth flavors is in how they time the cooking process. It’s tempting to dump all the ingredients in to a pot, bring it all to a simmer and walk away. That’s actually how you create stalk, the starting point for broth. To further enhance and develop the earthy base flavors in stalk I stick to a simple cooking order to insure killer broth every time. Master this first recipe and you’ll be set. Once you feel comfortable with the process try one of the exotic flavorful variations! In a dutch oven or large pot heat your oil to medium high heat. Chop your onion very finally, you want as much of that flavor seeping out in the broth so the smaller the better. Once your pot is hot add the onion and cook for 2 mins or until you start seeing some nice golden brown coloring. Turn the pot down to medium and continue cooking onions for 2-3 mins. Crush your cloves of garlic into the pot and give it a stir. Add your salt and cracked pepper and put the lid on the pot so the steam stays locked in and marries all the flavors together. Cook with lid on for 4-5 mins until everything is aromatic and cooked down. Bring your pot back up to medium high heat and add 2 cups of your stock. Bring that to a boil and continue adding stock 1 cup at a time every 3 mins until all 2 quarts are in the pot. Bring everything to a boil for 8-10 mins then cover with your lid again and simmer for approximately 20 mins. That’s it! Simple delicious broth – a canvas for anything. In a dutch oven or large pot heat your olive oil to medium high eat. Chop your onion very finally. Once your pot is hot add the onion and cook for 2 mins or until you start seeing some coloring on it. Turn the pot down to medium and continue cooking onions for 2-3 mins. Add your sesame oil at this time. Sesame oil burns quickly so adding it on top of the onions cushions it from direct heat and infuses the onions with its flavor. Crush your cloves of garlic into the pot along with the finely chopped mushrooms and give it all stir. Cook 2-3 mins until mushrooms start to get a little color. Add soy sauce, agave and pepper flakes then put the lid on the pot. Cook with lid on for 4-5 mins until everything is aromatic and cooked down. Bring your pot back up to medium high heat and add 2 cups of your stock. Bring that to a boil and continue adding stock 1 cup at a time every 3 mins until all 2 quarts are in the pot. Chop scallions and add to the mix. Bring everything to a boil for 8-10 mins then cover with your lid again and simmer for approximately 20 mins. Follow steps for basic broth but when adding your onion also add all your spices and red pepper flakes and allow them to toast until very aromatic. Right before you simmer the pot, add the fresh minced ginger and scallions. Heat your olive oil to medium high eat. Chop your onion very finally. Once your pot is hot add the onion, tumeric and red pepper flakes and cook for 2 mins until onions have begun coloring and the spices are toasted. Turn the pot down to medium, add finally chopped bell pepper and continue cooking onions for 2-3 mins. Crush your cloves of garlic and add your sesame oil at this time, stir, and cook down for 2 more mins. Add soy sauce, agave and lime zest the put the lid on your pot. Cook with lid on for 4-5 mins until everything is aromatic and cooked down. Bring your pot back up to medium high heat and add 2 cups of your stock. Whisk in your coconut milk. Bring it all to a boil and continue adding stock 1 cup at a time every 3 mins until all 2 quarts are in the pot. Chop scallions and fresh ginger and add to pot. Bring everything to a boil for 8-10 mins then cover with your lid again and simmer for approximately 20 mins.